The rash is caused by an allergic reaction to an oil in poison ivy, oak, and sumac. The rash may occur when you touch the plant or when you touch clothing, pet fur, sporting gear, gardening tools, or other objects that have come in contact with one of these plants. You cannot catch or spread the rash, even if you touch it or the blister fluid, because the plant oil will already have been absorbed or washed off the skin. The rash may seem to be spreading, but either it is still developing from earlier contact or you have touched something that still has the plant oil on it. If your doctor prescribed a cream, use it as directed. If your doctor prescribed medicine, take it exactly as prescribed. Call your doctor or nurse call line if you think you are having a problem with your medicine. Keep cool, and stay out of the sun. Wash well or throw away anything that came into contact with the plants. You can use an after-contact product, such as Tecnu Original Outdoor Skin Cleanser, to clean plant oil from your skin, clothing, or tools. Be sure to wash your hands before and after you use the washroom. Your rash gets worse, and you start to feel bad and have a fever, a stiff neck, nausea, and vomiting. You have new blisters or bruises, or the rash spreads and looks like a sunburn. The rash gets worse, or it comes back after nearly disappearing. You think a medicine you are using is making your rash worse. Your rash does not clear up after 1 to 2 weeks of home treatment. You have joint aches or body aches with your rash. 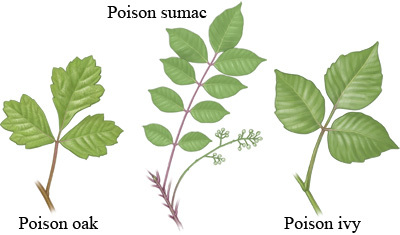 Enter W882 in the search box to learn more about "Poison Ivy, Oak, and Sumac: Care Instructions".